große Oper in zwei Aufzügen! 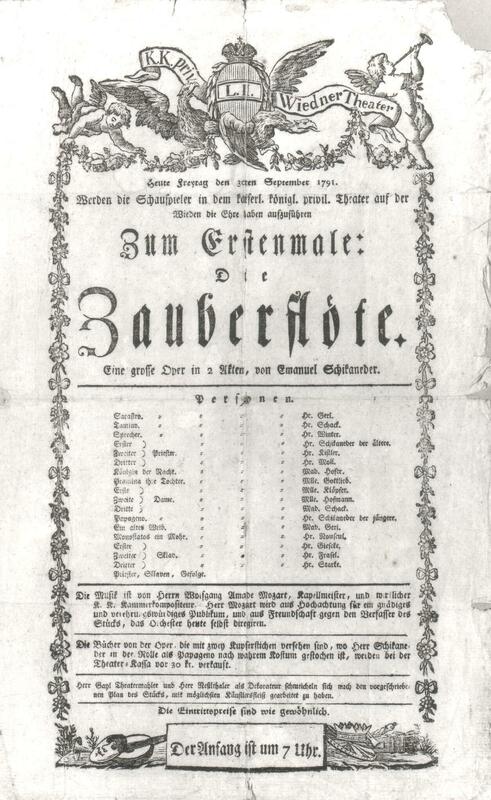 I've come to the decision that my next production will be Die Zauberflöte von Mozart. 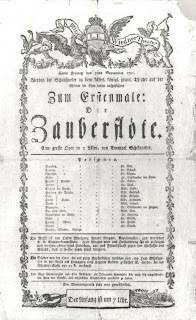 This production will be identical to the original Die Zauberflöte, that is, the theatrical work written by Emanuel Schikaneder (see program to the left), the triumphant drama, and will be absolutely true to it in every respect, including all the words and instructions, characters and costumes, and will, as did the original, support the triumph of enlightened absolutism oner the evils of the obscurantists, most notably personified by the Q of the N, Maria Theresa Walburga Amalia Christina. In sooth, in a quest for an absolute and a somewhat mercurial perfectionism, I have ordered my production assistant, the Rt. Hon. Mr. M___, to clone a copy of the Empress Consort (Holy Roman Empire) and Queen Consort (Germany) from a bit of bone marrow, a bit that I surreptitiously secreted from the Kapuzinergruft below the Capuchin Church on my last visit to Vienna, a trip whose necessary cover story was the yearly celebration of the new wine – the Sturm – but whose true raison was assumed through my intimate knowledge of the intimate pressings of the Masonic Temple Prostitutes, and thus realized by acts of which I may not be proud but were necessary nevertheless, in the service of art and its bounties. Well, OK, identical in all respects except for - I suppose it goes without saying - the replacement of the music, admittedly a hoary and bromidic element of the great work. I know that my adherence to the text and the meaning of the work may seem fetishistic, but truths are truths and thus must be given respect.